Copyright © 2017, NAVITEL s.r.o. All rights reserved. The content of this Manual, as well as any demo materials, are the sole proprietorship of the NAVITEL s.r.o. Any commercial use of this Manual may be carried out only with written permission from NAVITEL s.r.o. This user guide contains a description of features and functionalities of Navitel Monitoring dispatch system, developed by NAVITEL®. Navitel Monitoring is a browser supported program, main objectives of which are monitoring of different objects (vehicles, stationary and outside-mounted objects, people) and its key indicators (speed, fuel consumption, battery charge, etc. ), playback and preview of tracks on the map as well as reporting on the monitoring objects with possibility of choosing indicators included in the report. Interpretation of object data in reports and graphs. For proper operation system requires connection to the Internet. Screen resolution not less than 800x600, 19’’ diagonal. If necessary, you can use the program on your own server. 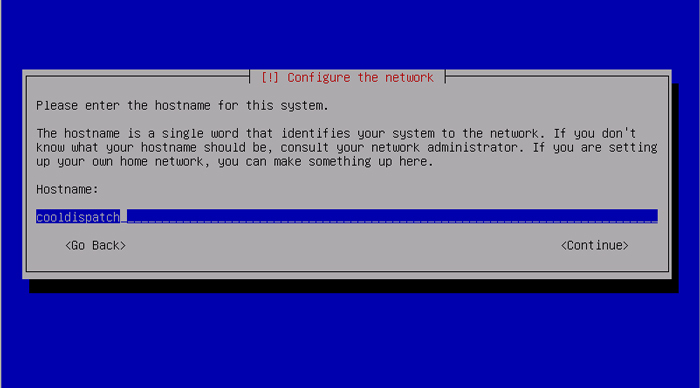 To do this, you must first install the server. For detailed installation instructions, see Section 2 of the Appendix. Supported browsers: Google Chrome 49 or later, Mozilla Firefox 45 or later, Opera 36 and later, Internet Explorer 11. For work start open the link https://www.dispatch.navitel.ru in a supported browser.To be able to log in to the program, you should know the login information. The login information includes username and password. Contact your manager or system administrator to get it. If you are a manager or an administrator, you should register at the https://www.dispatch.navitel.ru. If you already know the login information, proceed to the dispatch system website, and then enter your username and password in the corresponding text fields. User with administrator rights can also add a user to the system and assign him a password and a license period. You can find more details about the rights of the administrator in paragraph 4.12. Choose Exit ( ) in menu bar to log out and shut the system down. Shut down the system is also possible by clicking on the X in the right corner of the browser bookmarks, or closing the browser window entirely. To re-enter the system you will need to re-enter login and password of the user account. The program interface can be divided into three sections: Menu bar , Workspace panel  and Map . The detailed description of each section is provided below. From now on, these three sections of the program interface will be addressed the same as in this chapter. This bar contains a number of drop-down menus that provide access to main features of the monitoring system. The Objects menu contains tools for managing objects (adding, editing, reviewing or removing). The History feature displays information on events that happened with object in the specific period of time (start and end of moving, stop, alert, etc.) History also shows track specification with description of every input data from the device. 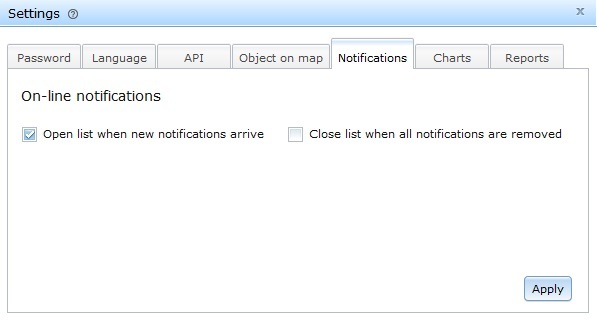 With feature Notifications you can review the list of current notifications, as well as set the new notifications about various events happening to the monitored objects. 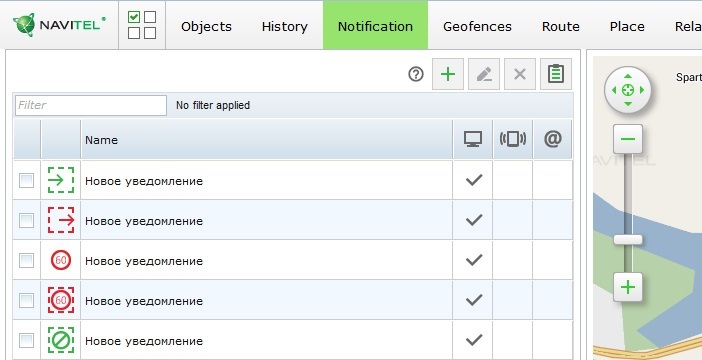 With Geofences, you can control the monitored objects in terms of their location and movement within the specified area. Geofence can be any specific area which is of interest of user. In the Route section of the menu bar, you can carry out operations related to creating routes and regulating traffic on them. The Place functionality is intended for saving frequently used address points in the program so as to make it easier to access and navigate them. With the help of the Relaying function, you can exchange data about positions of monitored objects between different dispatch systems. Feature Tasks can be used for setting different tasks in the form of reports. 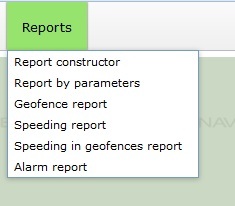 Clicking on the Report menu opens a special window where you can form and generate reports based on various parameters of the monitored objects. Additional features are available in the right part of the Menu bar. Notification button ( ) allows switching online service of notifications, coming out by presets. In the Tools menu ( ) you can work with different measuring tools (measure line, measure area), use the address search function, and regulate display of the Track player panel, Data actuality, Speeding modes and the Displayed period workspace. 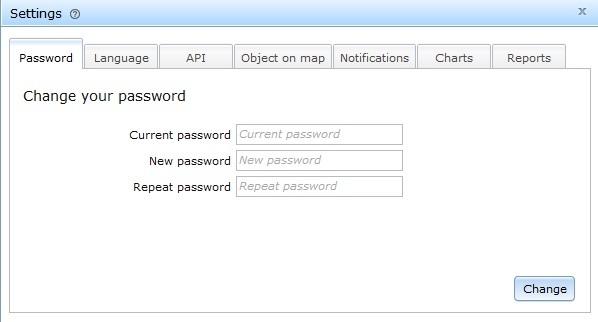 In the Settings menu ( ) you can change your password, select the language of the program's user interface, receive an API key, or define which parameters should be displayed in the Object on Map bubble. In the Admin menu ( ) you can configure user profiles, manage roles, and regulate licensing of your companies. The workspace panel is intended for carrying out basic work operations such as work with objects, places, geofences, notifications, history, etc. These work categories are located in different sections of the workspace panel. General settings and functions such as group selection, filter button, show all the objects on the map, add, edit, copy and delete buttons are located in the upper section of most sections of the workspace panel. In the middle of the workspace panel you will always find a list of items of a specific category filtered in accordance with the filter parameters that you set. To interact with a specific item, for example, to display an object on the map or change parameters of a geofence, you should select an appropriate item from the list. In certain operations you can interact with several items at a time, for that you should select several items. For each object in the list, the statuses of the main parameters are displayed, which are described in detail in p.4.1. This block in the bottom part of the workspace panel allows you to specify the time period for which you would like to see history of an object. 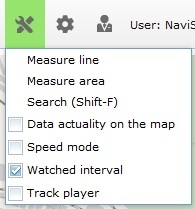 To show or hide this block, in the Tools menu ( ) mark the Watched interval checkbox. The map is used to monitor and track vehicles and view passed tracks and events, routes, and POIs. Upon clicking on a point on the map, the address information board (or the Address bubble) will appear. The address bubble contains coordinates and address information of the selected point. When clicking on the Up arrow in the address bubble, and then the Actions button, additional options appear: Add new place, Create geofence, Create Route. Map buttons are used for map navigation and zooming. You can also navigate the map with the help of the arrows keys or keyboard. 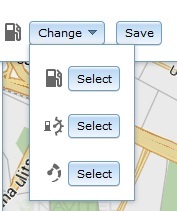 Multiple categories of POIs are displayed on the map with special icons. Whether a POI category is displayed on the map often depends on the map scale – different POIs are visible at different map scales. When zooming in the social object is showed (banks, hotels, restaurants), when zooming out – geographical (stations, bridges, tunnels). Upon clicking on a point on the map, the address information board appears. It contains coordinates and address information of the selected point. To open the additional options, click the Up arrow and then the Actions button. Similarly to the address bubble, you can click on any active monitored object on the map to open an information about that object. To configure data which should be displayed in the bubble, select the Settings menu ( ) and then open the Object on map tab. There, you can configure what information should be displayed in the bubble by checking or clearing checkboxes. Also, in the pop-up window, the sensors specified at adding object to the map can be displayed, such as Power Supply, Fuel Level, Axle Load, etc. (for details refer to 4.1.5). The Objects window is a section of the workspace panel. This section of the program contains functionality for creating, editing and deleting individual objects and groups of objects. 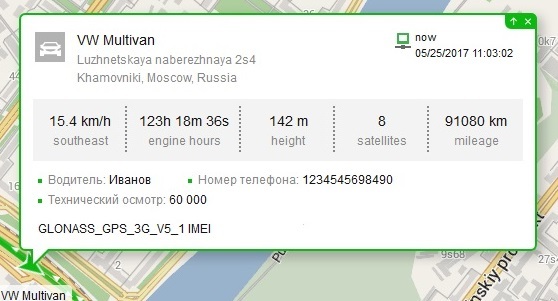 Object (monitoring object) - is a vehicle, equipment or other moving or stationary object being monitored with the help of data from the GPS / GLONASS-tracker installed on the object. To work with the objects press the Object button in the Menu bar. In the Objects section of the workspace panel you can see the list of objects limited to a certain group of objects. To see the list of all the objects from all the groups available to you, select All groups in the Group drop-down list. To begin monitoring an object, select the object from the list by clicking on it. To monitor several objects at once, mark the checkboxes of those objects. You can use the Watched period function to specify the time period for which you would like to display the track of the selected object. Open the New Device dialog box by pressing . The New device dialog box will open. 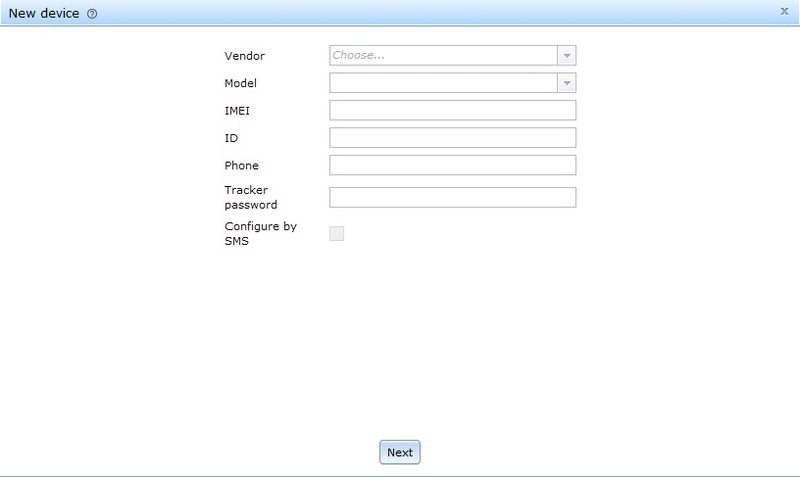 In the New device dialog box, select the vendor and model of your device, and then type in the details about your device in the fields below. After completion click Next. In the Name field, enter the object's name. Below, select the track color and the icon. Finally, select a group, to which you would like this object to belong. 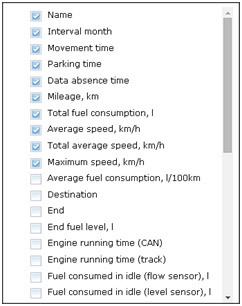 You can also define the speed limit and specify standard fuel consumption for the object. After you specify parameters, click the Save button. The tracker will be added to the list of objects in the Objects section of the workspace panel, to a corresponding group. In the Objects section of the workspace panel, select the object you want to edit. The Edit object dialog box will open. Note: After you assign an object to a new group, the object will not be displayed in the previous group anymore, and the access parameters of the object may change. The Edit object dialog box can also be accessed by pressing in the object's entry. From the Objects section of the workspace panel, select the object you want to delete. in the Objects section of the workspace panel, press . When creating or editing an object, it is possible to assign the object to a specific group of objects. Having divided objects into groups, you can perform actions in respect to multiple objects at once. This function might be useful if you want to create a geofence that would work for a large group of objects, or display a certain group of objects on the map. With this function, you can also create and save places that would be visible only within a specific group of objects, as well as generate reports on entire groups of objects. In the Objects section of the workspace panel, in the Group dropdown list, select the group in which you would like to create a new distinct set of objects. Right-click on the name of the group, then click Add. Assign a name to the new group. In the Objects section of the workspace panel, in the Group dropdown list, select the group that you would like to delete or edit. Right-click on the name of the group, then select Edit or Delete. After deleting a group, the objects in that group will be deleted as well. The program provides the display of all objects from the list on the map, without marking them with the checkmarks in the list in the left part of the window. To do this, click the Show all objects on the map ( ). When working with a small scale of the map, in the place of the clustering of several objects, an icon with the total number of objects will be displayed. In the Objects section of the workspace panel, you can see the list of all the objects in the selected group. In addition to base columns with object name, track color, and position, the table also includes a number of optional status columns. You can specify which of the columns should be in the table. To do that, click on Column settings just above the object list. In the opened pop-up window, check or clear appropriate checkboxes to display or hide columns. Statuses in the columns are displayed in the form of special icons. Place the mouse cursor over an icon to get the description of the icon. In the Objects tab of the workspace panel, go to Column settings > Add. From the dropdown list, select a gauge you want to assign the status bar to. 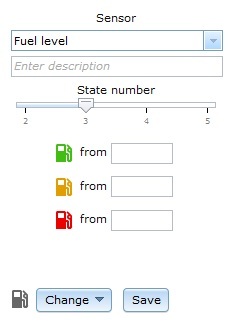 If available, indicate the number of displayed states. For each state, specify the value required for the state to come into effect. It is possible to change the icons of the statuses. To do that, in the gauge selection window, click Change, and then select a suitable icon. To edit a user status, in the Objects section of the workspace panel, click Column settings, and then press to the right of the status you want to edit. It will open a window where you can edit the status: change the number of its states and their enabling values, and change the status icon. To delete a status created before, in the Objects section of the workspace panel, click Column settings, and then press to the right of the status that you want to delete. Confirm deletion. To remove a specific status column, in the Objects section of the workspace panel, click Column settings, and then clear the checkbox of the status that you want to disable. In the Objects section of the workspace panel, select an object, and then press . 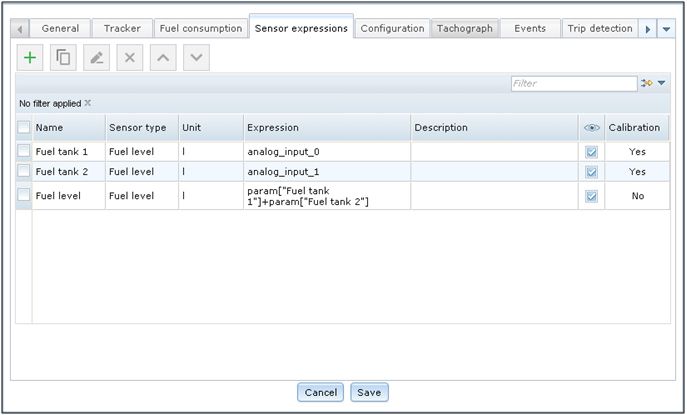 Select the Sensor expressions tab, and then press . 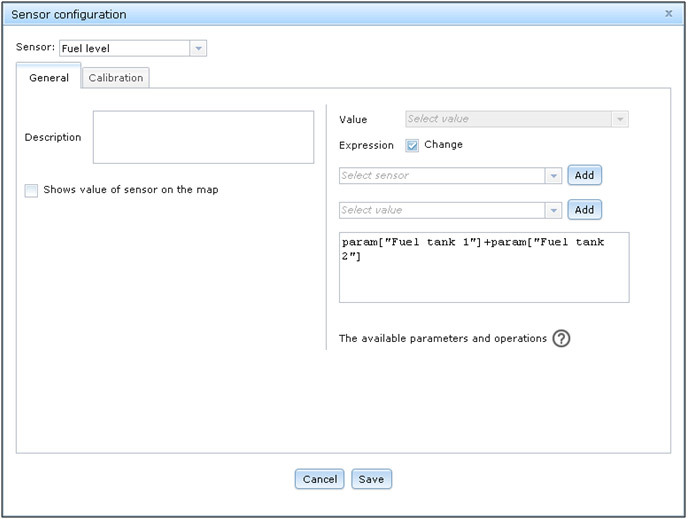 The Sensor configuration dialog box will open. 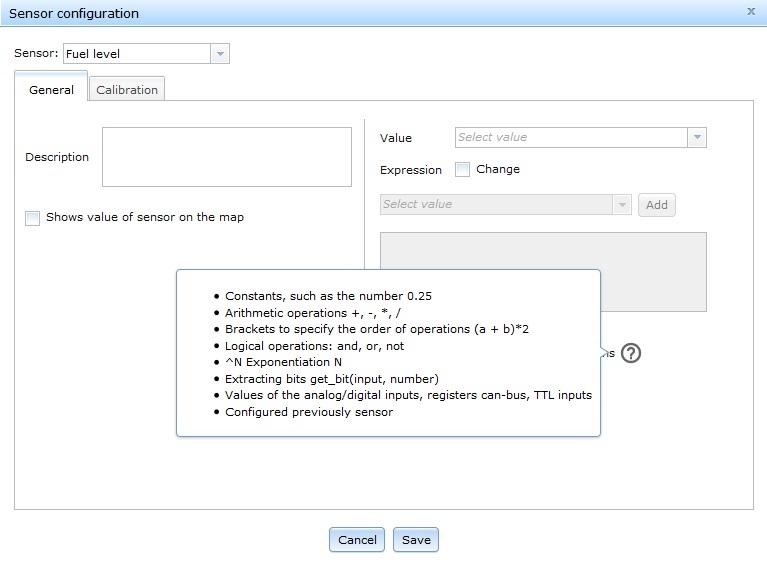 In the Sensor field, specify the type of the sensor you want to configure. In the Value field, specify the input used to connect the sensor. The chosen value will appear in the Expression field below. Marking the Change checkbox will allow you to edit the expression. In order to do that, select the desired values and click Add. Click on the question mark next to the words "The available parameters and operations" to see the list of symbols, as well as arithmetical and logical operations that will help you create custom expressions. When selecting some sensors, such as ignition or alarm, an additional field called Threshold will appear in the Sensor configuration window. It is necessary to specify the threshold voltage value in the Threshold field. Voltage below this value would mean 0, whereas above would mean 1, which will help the program to interpret and display information on sensor status. The threshold voltage value of a sensor is indicated in the documentation to the device or can be defined by special configurator software. Furthermore, the History window contains information about voltage in a specific input in different instants of time, thanks to which it is possible to compare these data with the de facto state of a tracker sensor. If in the Sensor field you choose "Additional sensor", two new fields will appear on the left in the General tab – Name and Sensor type. The former is for entering a custom name for the new sensor and the latter contains the same as Sensor field at the top plus "Arbitrary sensor". The content of the Value field on the right won't change. After configuration is complete, sensor information is displayed in the detailed history window. Sensor types and their functions. 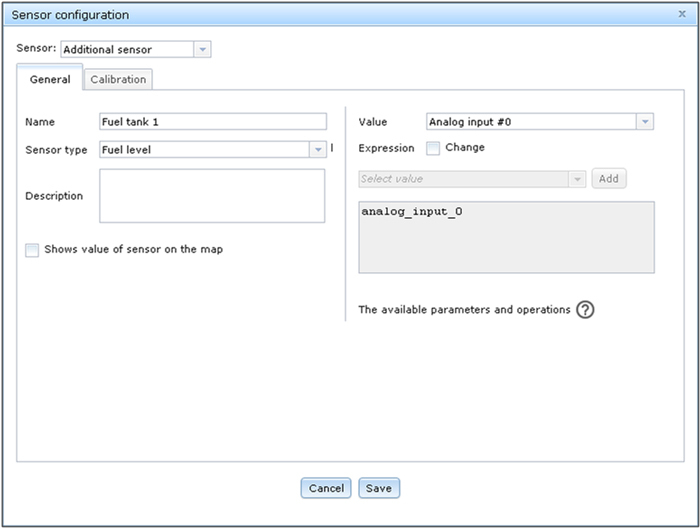 When you select a sensor's value, it is displayed in the Expression field below. Marking the Change checkbox will allow you to edit the expression. To do that, select a value from the list and press Add. Pressing on the question mark icon to the right of The available parameters and operations will display a list of parameters and symbols, as well as arithmetic and logical operations that will help you create custom expressions. This can be used to configure additional sensors. Below are two examples. The order in which the sensors are set up is important! 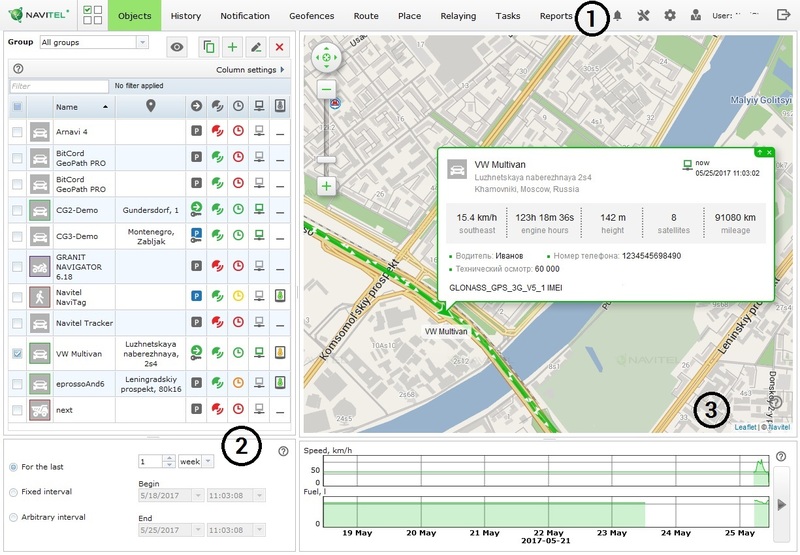 There are different methods of trip detection in Navitel Monitoring. You can select a suitable method of trip detection and define its core parameters. The chosen method of trip detection may affect reports and trigger some notifications, such as "Stop" or "Start". 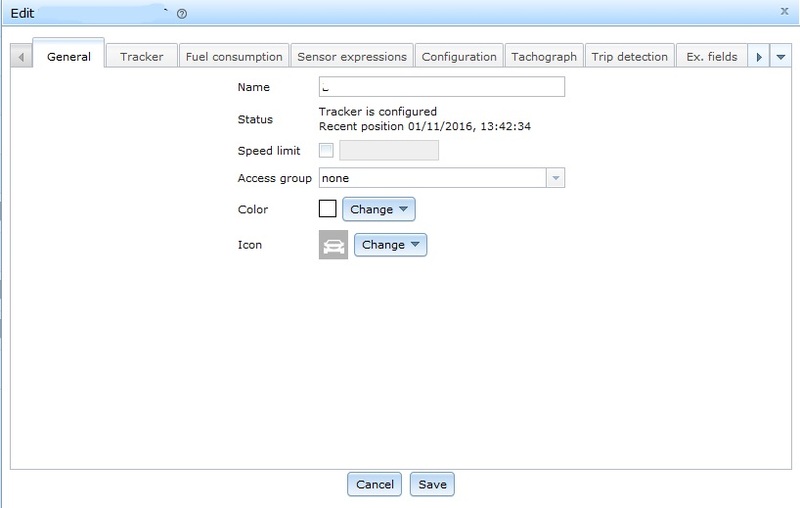 When configuring parameters of an object, open the Trip detection tab. From the Detection type dropdown listbox, select the appropriate detection type. Select the detection type depending on what gauges are available on the object. After completing the steps above, it is necessary to configure how the program should interpret the data it receives from gauges, so that it can distinguish different states of the object. There are three possible states an object can be in: "Ride", "Idle", and "Parking". An object can be in one state at a time. The table below describes all available data interpretation parameters that can be set. Minimum satellites count Specify the minimum number of satellites considered sufficient to prove the data is valid. Maximum parking distance Specify the minimum distance the object has to move to consider it as the start of a ride. Maximum parking distance Specify the distance the object has to move to register as it is no longer parked. Minimum ride duration Specify the minimum ride duration so that any movement lasting less than that will not be considered as a ride. Minimum parking duration Specify time the object should remain motionless to register it as parking. Minimum speed Specify the minimum speed at which the object is considered to be in motion. 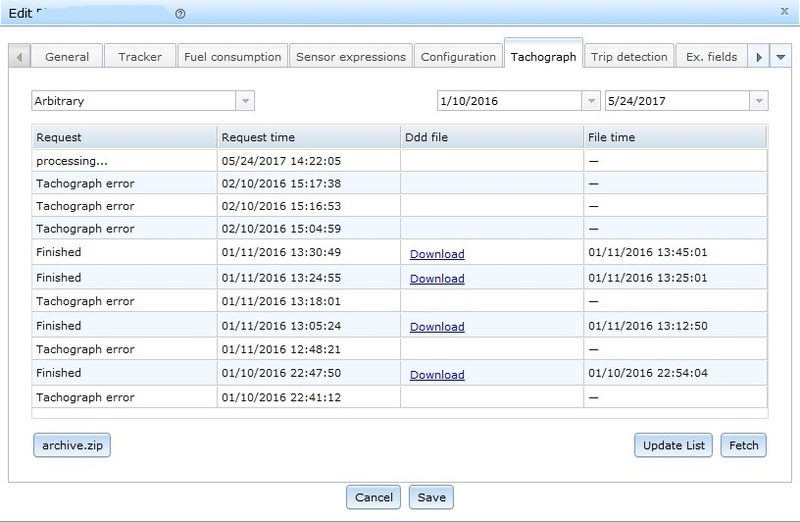 When configuring parameters of an object, open the Tachograph tab. Set up the time interval at which the information should be provided. Click Update list and select a suitable download option: download all information or download a particular file. The History feature is meant for display of information about movement of objects for a specified period of time. This information is displayed as a list of events, indicated in the ascending order of their occurrence, as well as in the form of a track on the map. The History feature is a part of the workspace panel. Click on the History tab in the Menu bar in order to switch to this section. In the History section of the workspace panel, in the Object drop-down list, select an object. Use the Watched interval box in the bottom of the workspace panel to define the time period for which you want to view the history. To enable the Watched interval box, on the Tools menu, select Watched interval. The history of the selected object for the specified time period will be displayed in the History section of the workspace panel. Clicking on a history event will make the map to move to the event place and open the address bubble. By default, history report also has detailed information. Detailing can be removed by unchecking "Show trip details" box at the top left of the list of events. To see details of the event, select the checkbox Show track detail. The detailed information will then be presented in a new window, in the form of a table. To update data in the table, click the Update button. With Geofences you can control the monitored objects in terms of their location and movement within the specified area. 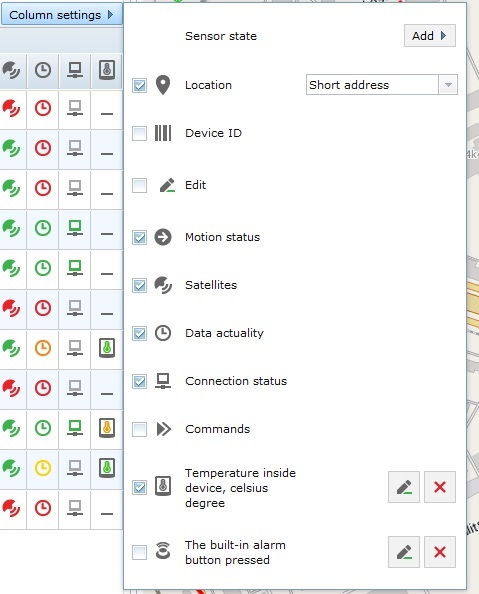 Particularly, having configured the notification parameters, you can see the exact time a monitored vehicle arrives or leaves a geofence, or track the start and end time of speeding occasions within a geofence. Click on the Geofences tab in the Menu bar. In the Geofences section of the workspace panel, you can see the list of geofences in the selected group. To see all the geofences, in the Group drop-down list, select the All groups category. To enable display of a geofence on the map, mark the checkbox of that geofence. You can display several geofences at once by marking more than one checkbox. 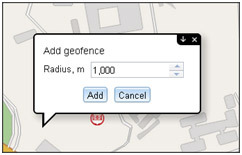 To display a geofence on the map, select a geofence from the list by clicking on its name. Having selected a geofence from the list, click Find the geofence on the map. 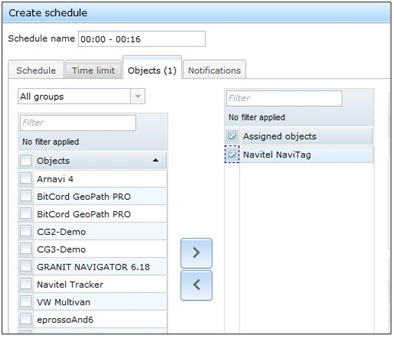 Geofences in Navitel Monitoring can be created in several ways – basic and customized. To create a basic geofence (circular shape), follow the steps below. Click on a point on the map. In the opened address bubble, click on the Up arrow. Specify the radius of the geofence. The geofence will be added to the list in the Geofences section of the workspace panel. When selected, it will be displayed on the map with a special icon. In the Geofences section of the workspace panel, press . In the opened Properties box, type in a name, indicate a group, and select a color for the geofence. Select one of the figures to the right of the Properties box, and then begin placing figure points on the map to form a geofence. To complete the shape, link the last point of the figure with the first one. To save the geofence, in the Properties block, click Save. The program also allows creating a geofence along a saved route, or along the passed track. To build a geozone along the route, go to the Routes section, select the desired route in the list of routes. Click on the route line on the map, in the opened window, click the Up arrow icon, then select Create geofence and specify the desired corridor width. Save the geofence for editing. To build a geozone along the passed track in the list of objects on the left, select the desired object. Click on the track line displayed on the map, in the opened window click the Up arrow icon, then Information, then select Add geofence around track and specify the width to display. Save the geofence for editing. In the Geofences section of the workspace panel, select a geofence that you would like to change. Below, in the Properties block, make the desired changes. If you want to change the shape of a geofence, find it on the map and move its corners to form a new shape. Click Save when finished to save the changes. In the Geofence section of the workspace panel, select a geofence that you would like to delete. 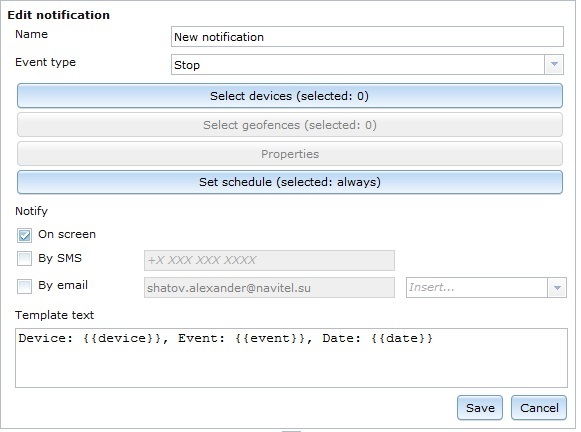 With this feature, you get notified about various events happening to the objects you monitor. To be able to receive notifications, it is necessary to create notification template. In notification templates, you can select the events of which you must be notified, the objects that should be subject to these templates, and make a pattern of the notification message. The Notification section of the workspace panel contains the list of configured notification templates with indication of template name, event type, notification method (message output to the screen, SMS, or email notification). To be able to receive notifications, it is necessary to create notification templates first. In notification templates, you can select the events of which you must be notified, the objects that should be subject to these templates, and make a pattern of the notification message. In the Notification section of the workspace panel, press . Enter name of the template and select the event type. 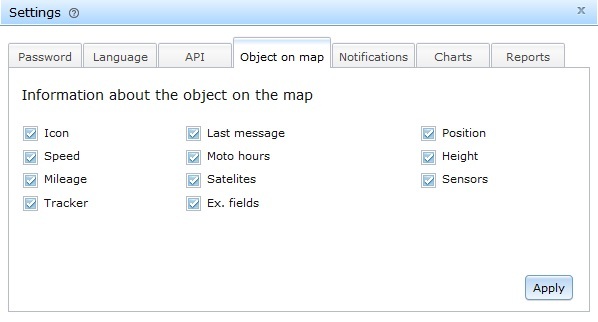 Select the monitored objects which the notification template will be applied to. If the selected event type implies it, select a geofence. Select notification channels (On screen, By SMS, by email) and create the template text by inserting the necessary elements with the help of the Insert function. In the Notification section of the workspace panel, select a template that you would like to change, and then press . In the Notifications section of the workspace panel, select a template from the list that you would like to delete, and then press . Journal displays the list of received notifications. To display the notification journal, in the right corner of the Notifications tab, press . The window to the right will open a list of objects and events that occurred with it. When you click an object or event, the map displays the object in the place where the event occurred. It is possible to filter the journal. Click on the words "No filter applied" to open the Filter dialog box. 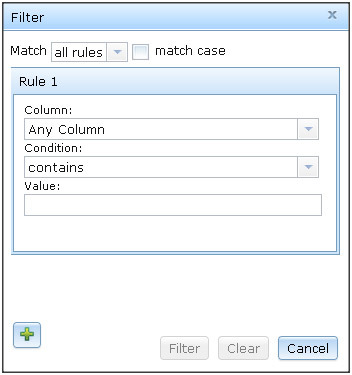 In the Filter dialog box you can create filter rules. 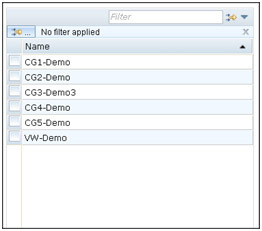 To create a filter rule, first select a column to scan for the value (the value is specified later). In the next field, Condition, indicate whether the value should equal, contain, start, end, or relate to the data in the selected column in some other way. Finally, in the last text field, specify the value. To delete all the filters at once, in the Filter dialog box, click Clear. To execute the filter rules, click Filter. In the menu bar you can find an online notification button. The number next to the button shows the total number of notifications received within a specified period of time - . When you click this button, a list of notifications appears containing the name of the object from which the message was received and the event that occurred with it. The list also contains an event button that the operator or dispatcher fills in when responding to an event. When you click the Report on the progress button, a window opens with a field for comments on how to handle the event. Type the text and click OK. The message about working out will be sent by SMS, e-mail, and also will be displayed in the report on the events. To clear the list of notifications, click Delete All. In the Route section of the workspace panel, you can carry out operations related to creation of routes and regulation of traffic on them. The entire procedure of working with routes can be split into a number of stages, with each stage dependent on the previous one. The first step is to create a route by marking all stop and route points. The program will then build an efficient route that goes through all the marked points. Secondly, it is necessary to plan a schedule. The next step is to add objects to the schedule. The objects are then defined into trips. 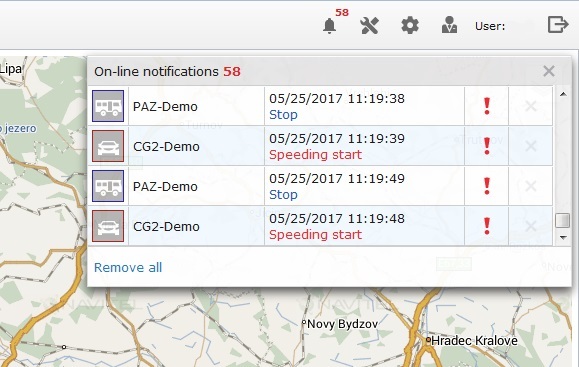 Finally, you can optionally set up notifications that will allow recording different events associated with vehicles, such as route deviation, delay, schedule overdrive etc. The Route window is a section of the workspace panel. To open it, in the Menu bar, select the Route tab. On the workspace panel, in the Route tab, press . Route configuration window will open. Define the first route point by filling out all the address point fields. Click Apply address. Press in the Waypoints block. Indicate the address of the next point on your route by filling out all the address point fields. Click Apply address. You can turn geofences and places into route points. 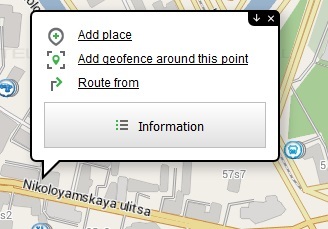 To do that, in the Waypoints block, click the Add from geofence or Add from POI button. Similarly, create the rest of the route points. When pressing a list will drop down where you can select whether the new point should be the last or first point in the route. If there is already more than 2 points in the route, the drop down list will contain more position options: After 1, After 2, After 3, etc. Select the suitable option to determine the point after which the new point should be positioned. Use buttons and to change the order of waypoints in the route. You can create correction points. Correction points are not considered waypoints and are used solely for route correction purposes. They change the route in a way the usual waypoints do, but they do not count as stops and are not obligatory to visit. To create a correction point, select the Is correction point checkbox when creating a waypoint. In the Route section of the workspace panel, in the Properties block, type in the route name, assign your route to a group, and, if necessary, set it a color. You can also indicate the vehicle type which this route is meant for. When all route points are added to the route, the program will calculate the length of the route and the approximate time required for the selected type of vehicle to cover this distance. In the Control and precision of passing setting, select a suitable option and use the slider to specify the degree of deviation from the route at which the "Deviation from the route" and "Return to the route" notifications should pop up. When the Points only option is selected, degree of deviation is determined by the distance between an object and a route point. When Points and route is selected, degree of deviation is determined by the distance between an object and the route line. The route will be added to the list in the Route section of the workspace panel. Upon selecting this route from the list, it will be displayed on the map. You can also create a route with self-selected points on the map. Click on the map to any place where the prospective route will pass. Then select the remaining points. Use the buttons and if you need to change the order of the waypoints in the route. To edit a route, in the Routes tab of the workspace panel, find the necessary route and then press . In the opened window, make the desired changes and click Save. To delete a route, in the Routes tab of the workspace panel, find the necessary route and then press . To copy a route, in the Routes tab of the workspace panel, find the necessary route and then press . To display all points of a route in the form of a list, in the Routes tab of the workspace panel, select a route. Then, in the section below, open the Points tab. 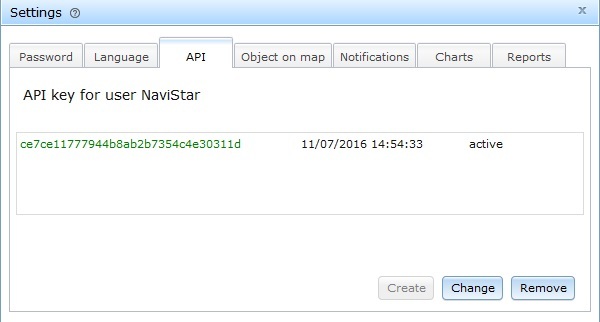 In Navitel Monitoring, "Schedule" is a timetable that defines the time required for passing the entire route and its separate stop points. In the top-left corner of the Create schedule window, enter a name. If no name was specified for the schedule, an automated name is applied indicating the beginning and the end time of the schedule. In the Schedule tab of the Create schedule window, in the Arrival time column, specify the arrival time to each of the route points. In the same column, to the right of the sign ±, specify the permitted deviation from the estimated arrival time to each route point. 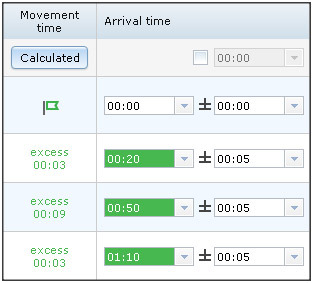 In the Movement time column, click the Calculated button to see the estimated time needed to cover the distance between route points and receive a forecast on the adequacy of the specified arrival time. In the Parking time and Departure time column, specify the duration of stops at route points and possible deviations. You can leave them empty. In the Can skip column, check the route points that should not be considered mandatory to visit. 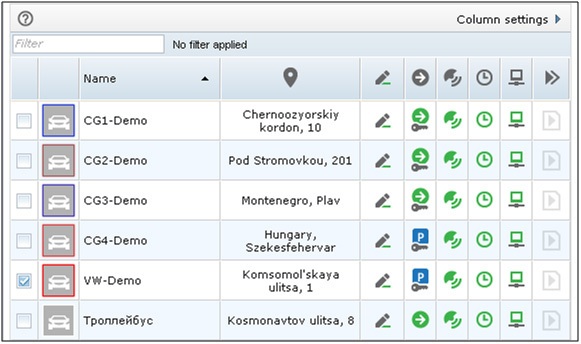 In the Checkpoints column, select the Shuffle points checkbox to establish the free order of visiting points. In the list to the left, select objects that should be linked to this schedule. You can use filters and grouping to find objects faster. Use the buttons and to add or remove objects from your schedule. The schedule will then be added to the list of schedules of the route. To shift the entire schedule time forward or backward, in the top-right corner of the Schedule tab, click on the Shift schedule for pop-up. In this pop-up window, select a suitable interval of time, and then click + or – to move the schedule by this interval forward or backward respectively. If necessary, you can set an abort timer to abort trips that cannot be completed in time. In the bottom part of the Create schedule window, in the Abort after box, set the number of days and hours/minutes that need to pass for the incomplete trip to get automatically aborted. By default, the Abort after function is set equal to the trip duration, and hence, if not completed in time, trips are aborted at once. To edit a schedule, in the Route section of the workspace panel, in the Schedules tab, press in the box of the schedule that you need to edit. The Edit schedule window will open containing the same functionalities as those of the Create schedule window. Make the necessary changes and then click Save. To delete a schedule, in the Route section of the workspace panel, in the Schedules tab, press in the box of the schedule that you want to delete. Term "Trip" in Navitel Monitoring implies a movement schedule intended for a particular object and based on a timetable of route passage. Trips can be created manually and automatically. Automatic trips are created (repeated) on a day-to-day basis. To enable automatic creation of trips in compliance with a particular schedule, in the bottom-right part of the Create schedule window, select the Auto trip creation checkbox. In the Route section of the workspace panel, in the Schedules tab, having selected a route, click this button in the field of the schedule to which you would like to add a trip. The Create trips window will be opened. In the top part of the Create trips window, indicate the activation time of the trip by selecting date and time of the trip start. 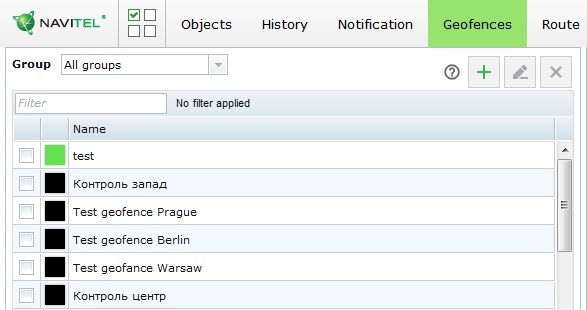 In the Create trips window, open the Objects tab and make sure that a correct object is selected for this trip. The trip will be created and added to the list of current schedule trips. The list of trips is available for viewing in the Trip table on the map. You can display the list of all objects defined into trips and associated with the current route. To do that, select a route from the list of routes in the workspace panel, and then open the Objects tab. 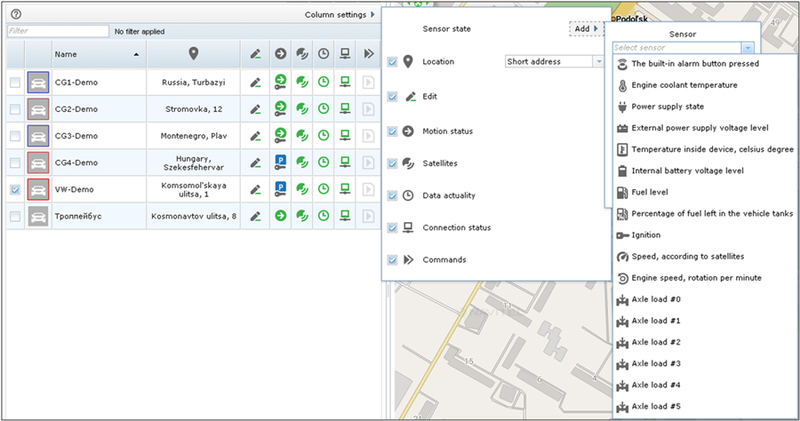 If the Route section of the workspace panel is active, the Trip table is displayed in the bottom part of the map. The table contains information about all trips of the selected route. At the right side of the table, there is a column that contains the Edit and Delete buttons. Switch to the Trip chart tab to see information about trips in the form of a chart. In the Routes section of the workspace panel, on the Schedules tab, press in the field of the schedule to which you would like to add a new trip. In the upper part of the Create trips window, in the Activation time dropdown listbox, select a suitable time and date option to specify the starting time of the trip. It is possible to set up time limitations for automatic generation of trips. 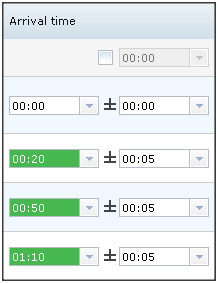 To set them up, in the Create schedule window, select the Time limit tab. By marking corresponding checkboxes, indicate the days and months on which this trip should be repeated. You can also set up the Time schedule configuration to specify the time range within which the trips must be repeated. To do that, select the Time schedule checkbox, and then click Add interval. A new line will be added under the Time schedule checkbox. There, specify the time range. Finally, you can specify the date and time until which the automatic creation of trips must keep working. 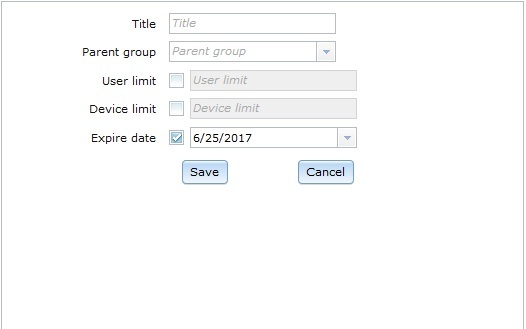 To do that, in the Create schedule window, on the Time limit tab, select the Create trip until checkbox and indicate the date and time. Notifications allow you to receive information about events related to a schedule trip. In the Create schedule window, open the Notifications tab. In the panel to the left, select suitable notification conditions. 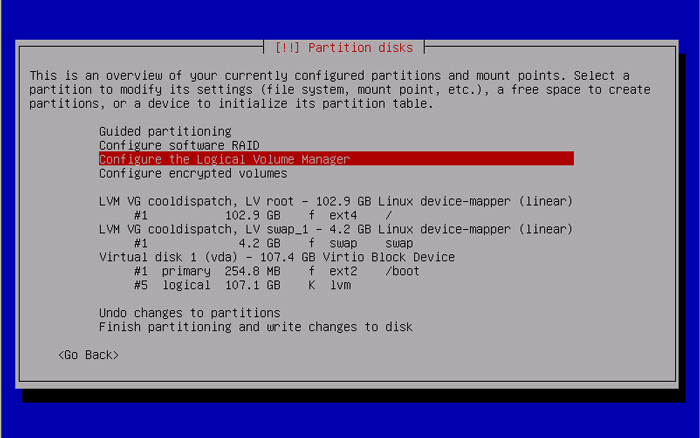 In the central panel, select methods of notification. In the right panel, create the template text by inserting the necessary elements with the help of the Insert dropdown list. This functionality is intended for saving frequently used address points in the program so as to make it easier to access and navigate them. 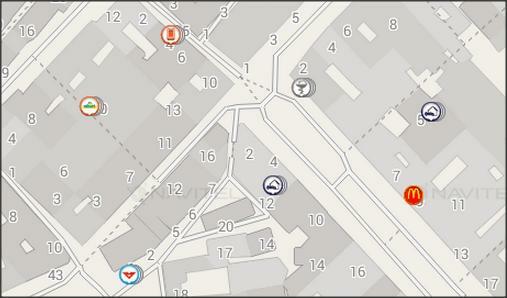 In addition to that, the Place points are displayed on the map in the form of special icons. Places can also be assigned to Object groups). This feature can be accessed by opening the Place section of the Menu bar. In the Place tab, you can see the list of addresses saved before. To see all the places saved, in the Group dropdown listbox, select All groups. 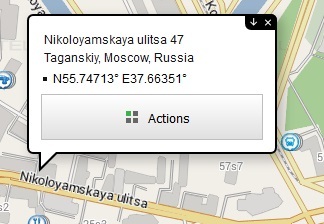 To show a place on the map, click on the place address in the list. 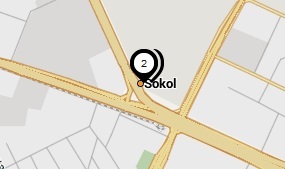 Click on a point on the map, the address of which you would like to save as a place. Give a name to the point and assign it to a group. If the name is not set, the address name is applied to the point. The place will be added to the list that you can see in the Place section of the workspace panel. 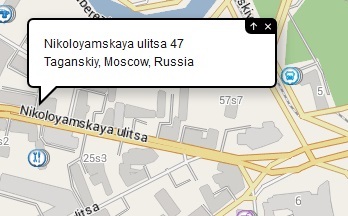 It will also be displayed on the map with a special icon when selecting this place from the list. In the Place section of the workspace panel, select the place that you want to edit. Below, in the Properties box, make the desired changes. In the Place section of the workspace panel, select the place that you want to delete. With the help of this function, you can exchange data about positions of monitored objects between different dispatch systems. In the Menu bar, open the Relaying tab. In the top-right corner of the workspace panel, press . The Relaying window will be opened. Fill out the fields: Name, Protocol, Host, Port, and Access group. From the left column, select the objects that you want to retranslate and place them in the right column using and , button. It is possible to generate reports on monitored objects in the program. To open the Report window, select the Report menu from the Menu bar. In the Report window, select the data and objects that you want to include in the report and specify the time period for which the report should be generated. 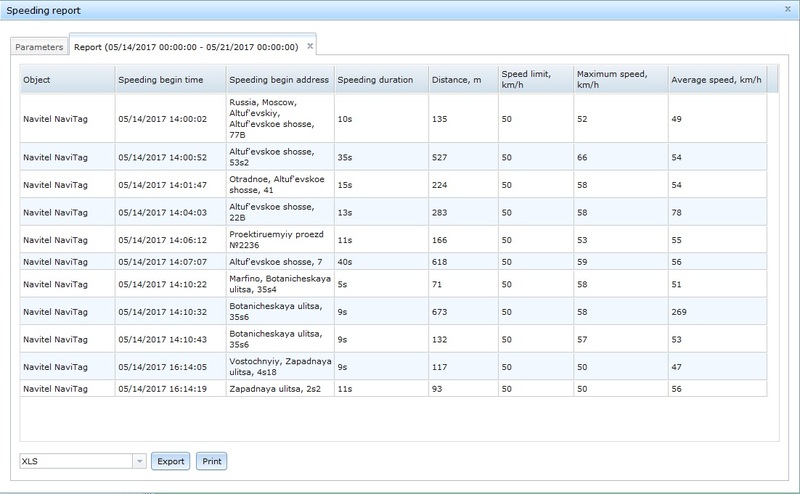 The program includes prepared report templates, such as reports on parameters, geofences, speeding, speeding in geofences and alarm reaction. To generate a report on individual settings, you can use the Report Constructor in which you will need to create a report template. To do this, select the data that you want to display in the report; Objects for which data will be provided, as well as specify the time interval that should be covered in the report and the schedule for the formation of the report. Completed report is displayed in the program, and also can be sent to print and exported to a computer in the formats CLV, XLS and PDF. In the left section of the Report constructor window, select the types of data that you want to include in the report. In the central section, select the objects on which the data should be gathered. Click on "No filter applied" to filter objects or click the Group dropdown list to select a specific group of objects. 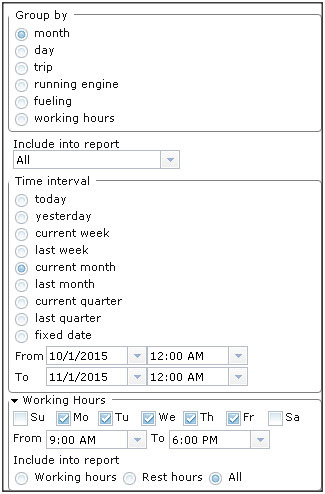 In the right part of the window, define the time period for which the report should be generated. In the bottom left part of the window, click Run. It is possible to create report templates. To do that, in the Report window, click Save Template as, and then specify name and, if necessary, indicate a group. The current settings of the report will be saved as a template, which can be subsequently used to generate reports. By using the Save Template and Delete buttons, it is possible to make changes to the active template or delete it accordingly. It is not possible to delete default templates. Monitored objects can be given tasks to send a report, generated in saved template, by SMS, by e-mail or to be shown on the screen. When you click the Task button on the left, you can see a list of saved tasks, the ability to turn on/off the task, and the number of tasks completed in a given time period. To create a new task, click the Tasks tab in the menu bar. Then press in the top right corner. In the Task properties window, create a name and choose the way to send the report. Press Select objects to select the object that you wish to perform the task. Go to Task parameters for more detailed settings (i.e., for reports that would be report template, time interval covered by the report, etc). 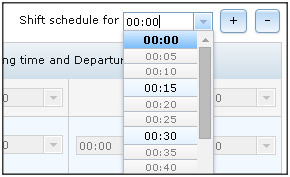 Select Time limits to choose the hours, days and months on which the task should be performed. Use the Tools ( ) menu to search for addresses, play tracks, change display settings of the Displayed period box, and measure distance between points on the map and radius or perimeter of an area. On the Tools menu, select Measure line. The mouse cursor will take a different shape and the Measure line window will be opened. Left click on the map to position the first point. A dash line will be connecting the cursor and the point. The first section is formed. Length of the section is displayed in the Measure line window. Each subsequent point you place on the map forms an additional section and continues the line. 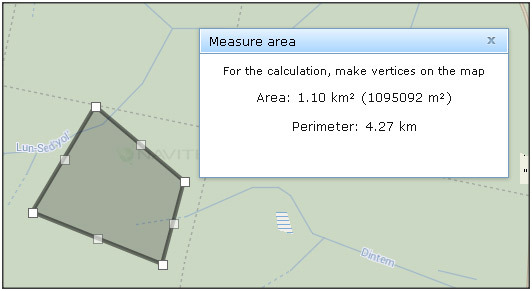 In order to finish placing points on the map and complete the measure line, click on the last placed point. The Measure line window displays length of each specific section of the line as well as length of all the sections combined together. Length of each section is also displayed right above their respective points on the map. On the Tools menu, select Measure area. The mouse cursor will take a different shape and the Measure area window will be opened. The first side of the figure is formed. At least 3 points are required to complete the figure. The program generates and highlights the region out of the placed points by connecting the first and the last points placed. The generated region is painted gray. A cloud above the region displays the area estimations. 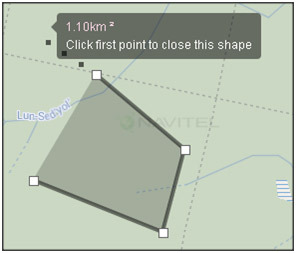 In order to finish placing points on the map and complete the area, click on the first placed point. The Measure area window displays the area and perimeter of the region. To find a specific address on the map, in the Tools menu, click Search, fill in the text fields, and then click OK. It is also possible to access the Search function by using the Shift + F shortcut. Tracks are displayed in different colors that indicate different speed rates. The Legend bar displays correlation between speed rates and colors. To see the colored tracks on map, turn the Legend bar on. To do this in the Tools ( ) menu select Speed mode. If you want to turn the track player on, in the Tools menu, select Track player. To playback track simulation, select an object from the list in the Objects section of the workspace panel, and then with the help of either a Chart or the Displayed period box, define the point of time from which you would like to play your track. The Track player dialog box contains buttons responsible for turning the playback on and off, pausing, and changing the playback speed. During the playback, the map moves along with the monitored object. Objects can provide their data at different time periods and at different frequencies (from 1 minute to 1 day). To display the relevance scale of the data received from the object on the map in the Tools menu ( ), tick the Data actuality on the map. Objects on the map will change color according to the scale. 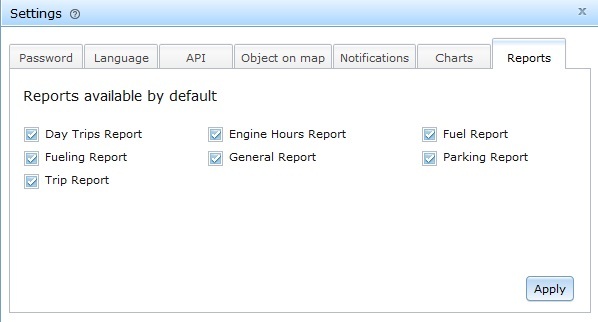 In the Settings menu you can apply a new password, change the interface language of the program, generate an API key, configure the types of data that should be displayed upon clicking on a monitored object on the map, set-up online notifications, toggle the visibility of the Speed and Fuel charts, and choose which report templates are available by default. On the menu bar, click Settings. In the opened dialog box, switch to the Password tab. In the first text field, enter the password to your profile. In the two subsequent fields, enter a new password. Click Settings in the menu bar. 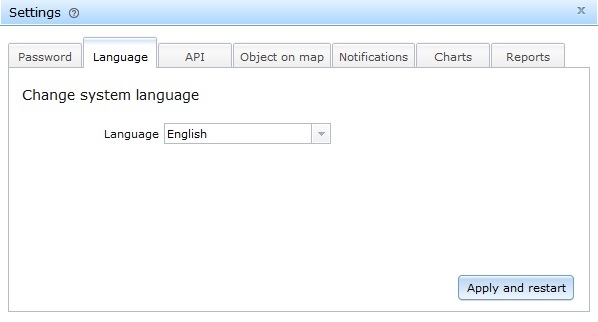 In the opened dialog box select the tab Language. Select your preferred language from the dropdown list. Through the API requests it is possible to make changes to the data of users, objects, user lists, and also perform other operations with data in the system. To authorize such requests, the system requires an API key. In the opened dialog box, switch to the API tab. The program generates a key and displays it in the box below. In this tab you can select the data to be displayed in balloon object information on the map (baloon opens by the click on the object). Tick the items you are interested in and click Apply. In this tab you can configure the display of online notifications. The purpose of this program feature is to display graphical information about the values of the speed and fuel sensors for a specified period of time. To display a graph on the screen, in the Chart menu select the graph you want to display. There are two graphs – Speed and Fuel - available for display in the program at the moment. Please pay your attention that to display graphical information about the values of a sensor, an object must be selected first. Charts can be used as an alternative to the Displayed period box. To set the determined time period without using Displayed period function, for example, you can scrolling the mouse wheel while pointing the chart. Moving the mouse pointer to the left or right while holding a point on the map allows you moving the specified time range backward and forward. Any changes applied to the displayed period using the Chart functionality will be reflected in the Displayed period box. Upon selecting the Speed option, the speed chart of the selected object appears in the bottom of the map. The chart displays change of the selected object speed (km/h) over a displayed period of time. Moving the mouse cursor to a point in time on the chart will display the detailed speed data on that particular point of time. When track displayed in real-time, the chart updates according to object motion. When the track player is on, and if there is a point selected on the chart, the track will start to play from this point. Scrolling a mouse wheel when pointing at the schedule allows to increase/reduce specification of a time scale. 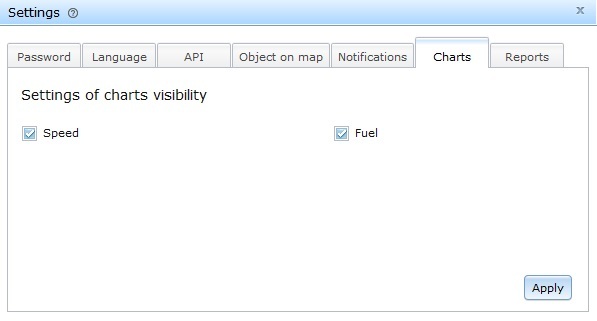 Upon selecting the Fuel option, the fuel chart of the selected object appears in the bottom of the map. The chart displays change in the fuel level (liters) of the selected object over a Displayed period of time. Moving the mouse cursor to a point in time on the chart will display the detailed fuel level data on that particular point of time. When the Displayed period is selected as For the last, the chart updates on a real-time basis. When the track player is on, and if there is a point selected on the chart, the track will start to play from this point. In this tab you can select the report templates available by default. Use this option to manage the system licenses. With the help of this window, it is possible to create companies within the framework of your access group and set up the license policies for the companies you create. To work with licenses in the menu bar, click on the Admin menu, and then select Companies. In the left side of the window that opens, a list of all the licenses available to the company, indicating the number of users, devices, object monitoring, license expiry and creation date of license. On the right side of the screen you can customize the name of the company or the user, the number of licenses and their period. The number of users on a single license. The number of available licenses for each company is set by the system administrator. When installing the system from scratch the number of licenses specified in the installation process. The number of users that can use the license is set by the administrator. If the system is installed for the first time, the number of users on a single license specified during installation. Period of license is specified by the administrator. If the system is set for the first time, allowable duration of the license period is set during installation. Administrator can change (extend or cancel) the license period by changing the expiration date of the license. Upon the expiry of the license login becomes unavailable, and at attempt to enter a user name and password, the system displays an error message. To add a new license, in the settings box to the right, click Add, then fill in the required fields and click Save. In the Companies window, select a license from the list, and then click the Edit button. Or, if you want to delete the license. This menu option is used to display the list of users with indication of their details and contact info, as well as companies, whose licenses they work under in the system. It is also possible to add new users and edit settings of existing ones in this menu. On the menu bar, click the Admin button, and then select the Users menu option. In the newly opened window, in the settings block to the right, click Add. The user will be added to the system. In the newly opened window, select the user you want to edit from the list. In the right part of the window, click Edit. Make the necessary changes in the user settings. This feature allows you to assign roles to different users. In Navitel Monitoring, role is a set of rights that can be granted to a user. In the program by default, there are 3 roles, each with its own set of rights - Administrator, Manager (Dispatcher), Operator. To open the Roles window, on the menu bar, click Administrative Tools, and then click Roles. In the left part of the opened window, you will see a list of users and the role for each, and the block on the right will display the credentials according to each role. Review: allows reviewing monitoring objects of the group and its subgroups, as well as monitoring tracks and events related to the obects. Edit: allows creating new monitoring objects, delete, and edit monitoring objects of the group and its subgroups. Review: allows reviewing geofences, places, report templates in this group and its subgroups. Edit: allows creating new, delete, and edit geofences, places, report templates in this group and its subgroups. Review groups: allows review this access group and its subgroups. Edit Group: allows creating a new group, and edit the name of the existing groups. Access Control: allows editing user rights with respect to this group. Review license: allows reviewing company’s licenses in the group and its subgroups. License Management: allows creating new, delete, and modify the license of companies in the group and its subgroups. Review User: allows reviewing the users group and its subgroups. User Management: allows creating new users, delete or edit users in the group and its subgroups. Also it allows changing the rights of these users regarding the groups that have the right to control access. See the table below for the detailed breakdown of permissions for each of the roles. It is possible to edit the roles or create new roles with their own sets of permissions. In the Roles dialog box, in the settings box to the right, click Add. Make up and enter a name. From the list below, select the rights that this role should be given. In the Roles dialog box, select a role. In the settings box to the right, click Edit. Table 1 – Supported trackers and their configuration (See 4.1.1. chapter Add new object). 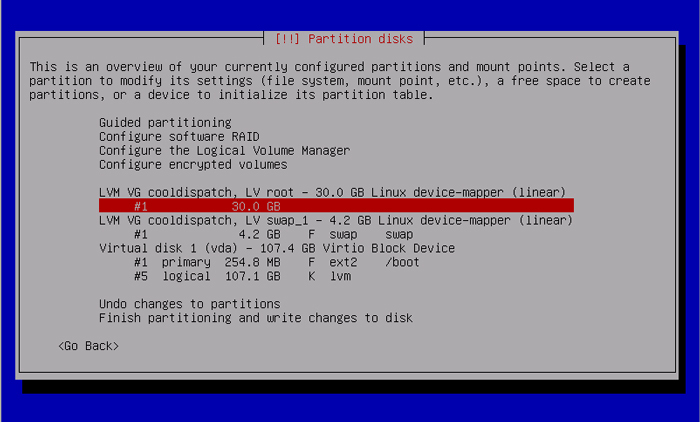 To be able to administrate and control NAVITEL© monitoring system the server, based on Linux, must be installed. 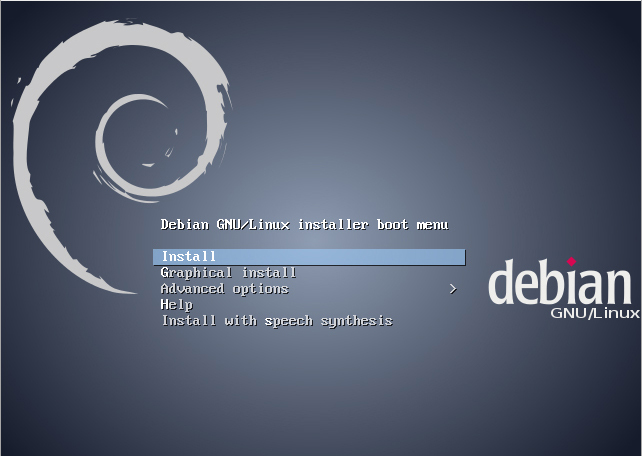 We recommend using Debian GNU / Linux OS. 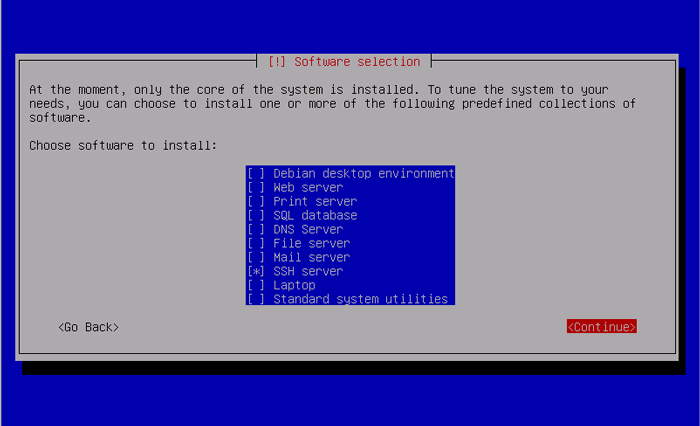 Below there is a step by step instructions for installing the server in the Debian system. 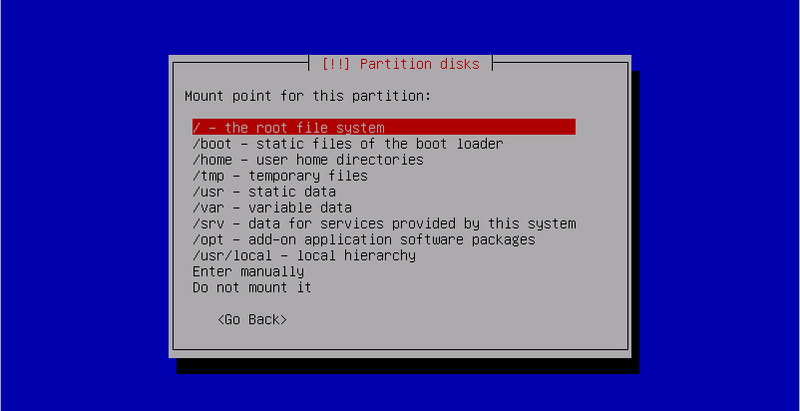 The boot system file is available on the Internet in a variety of configurations. 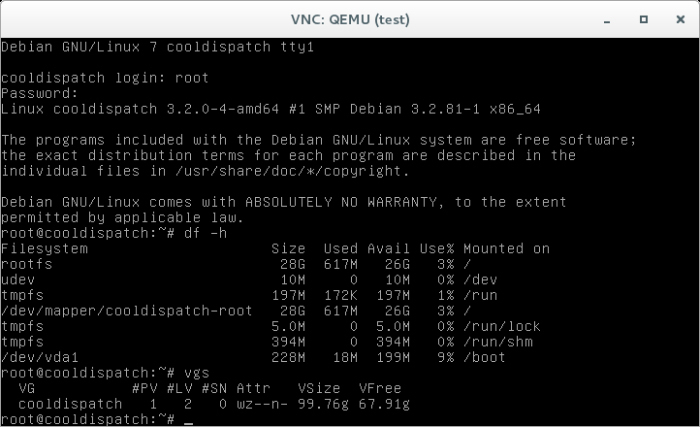 For NAVITEL© monitoring system it is recommended using Debian system on the amd64 platform. After downloading the installer on your PC run the installation of the system. 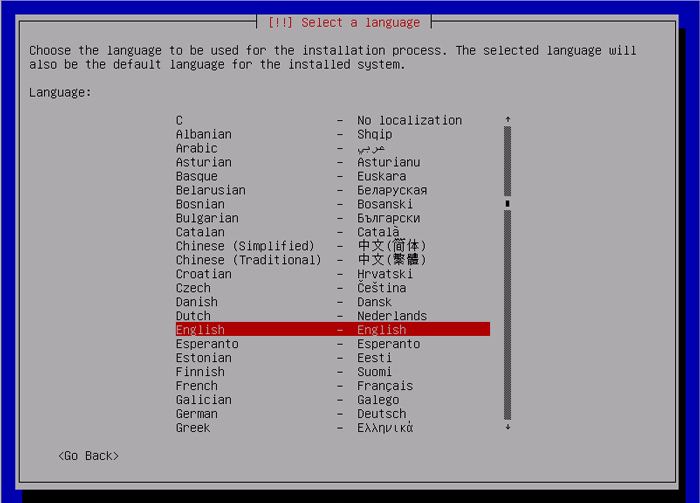 In the opened window choose "Install"
In the window configuring the keyboard select «English», then selecting configuration for keyboard. Select American English. The domain name can be specified any at will. The field can also be left empty, and change later. 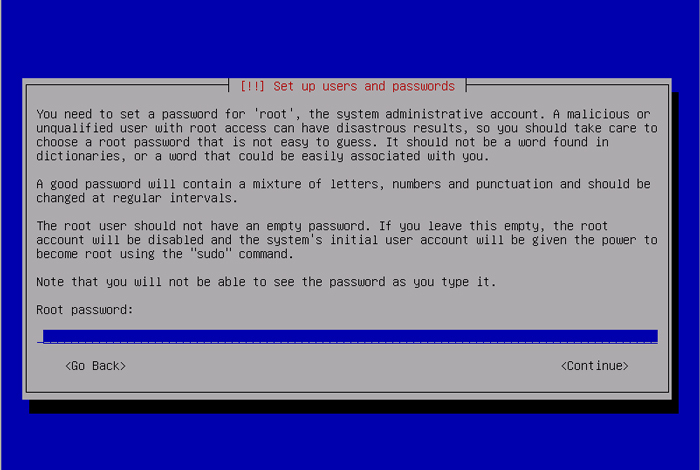 In the window setting user account data, enter the password for root-user, and then repeat it again. Next, enter the parameters of the first user of the system - the user's real name and the account name under which the system will recognize the user. Then, create a password for the account and enter it again. Next, the system will attempt to configure the server time zone automatically receiving the settings from the Internet. If the system will not be able to configure the zone automatically, it offers you to select it yourself. You can select any zone. 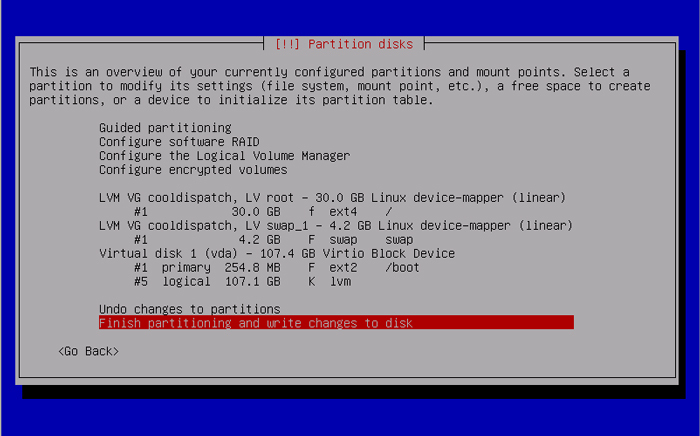 The system then will run the software RAID and offer to partition a disk into sections. 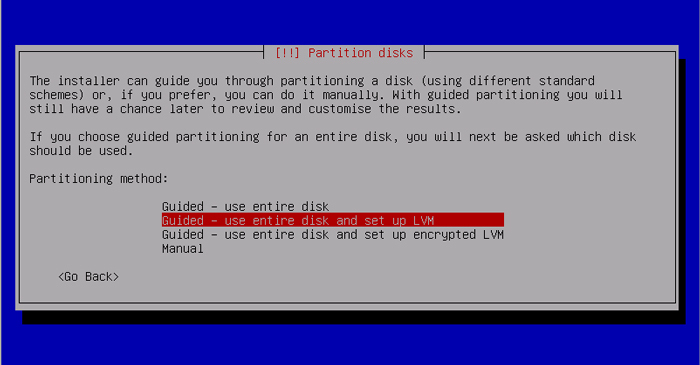 Select «Guided - use entire disk and setup LVM». 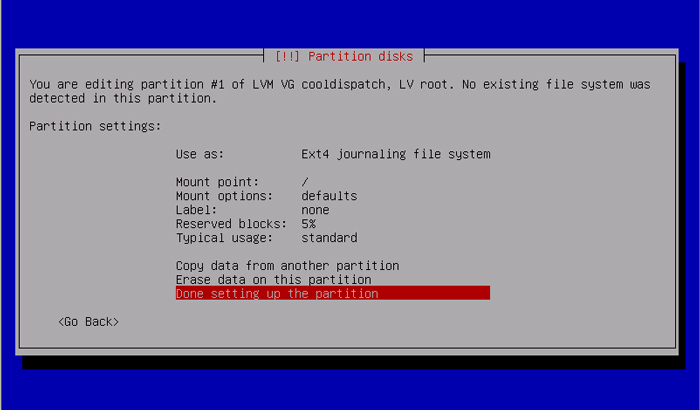 Select the disk for partition and press Enter. 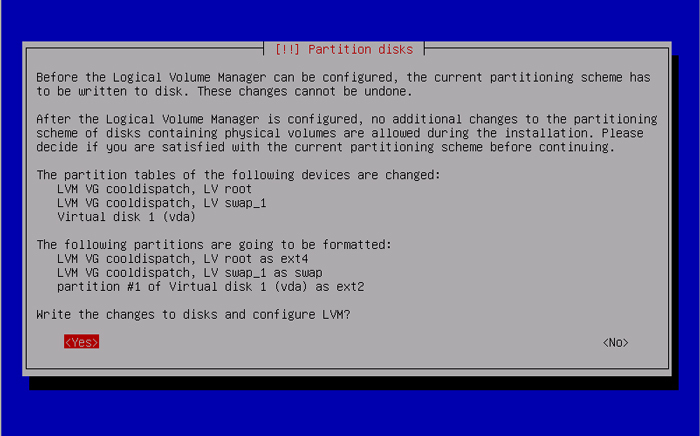 To configure the Logical Volume Manager, you must first remove the current. 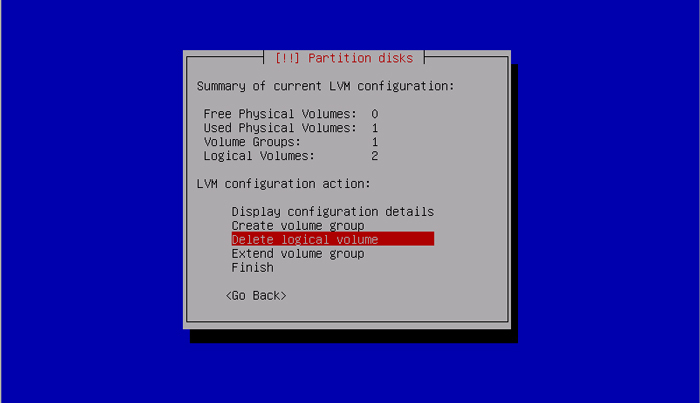 To do this, select the «Delete logical volume», and then, select the volume that you want to delete. In this case it is /root. Then you create a new volume. 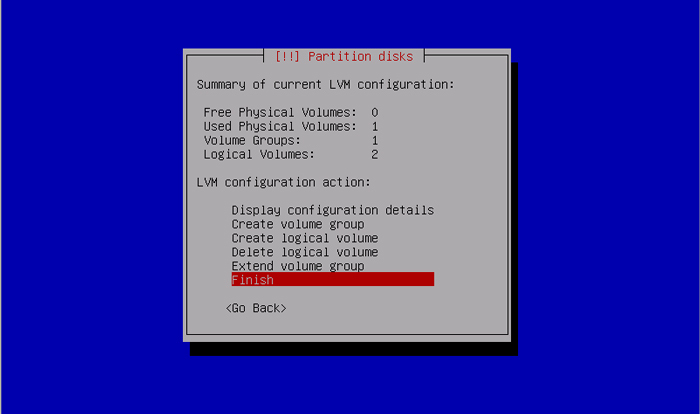 To do this, select «Create logical volume», then select volume group for the new logical volume. Enter the new volume name. Then, select the volume size. In this case - root and 30G. Press «Finish», to complete the logical volume configuration. 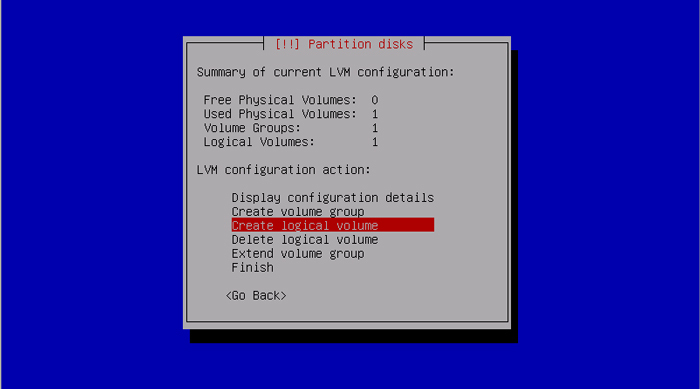 Then select the file system to create logical volumes. 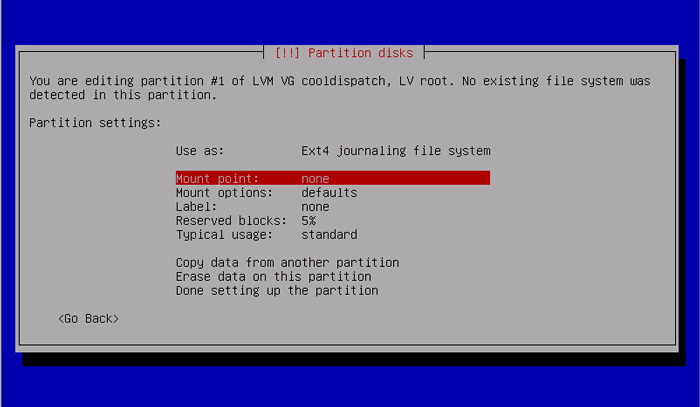 To do this, in the Settings window, select the created volume for the subsequent modification of the file system and mount options, and press Enter. 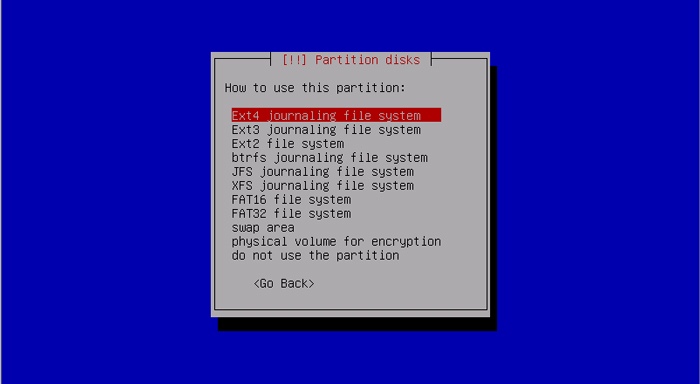 In the opened editing window in the «use as» section select the «Ext4» for the file system. Before starting the process of creating the server, system will update the input data again. If the data is correct, all changes must be confirmed by pressing «Yes». 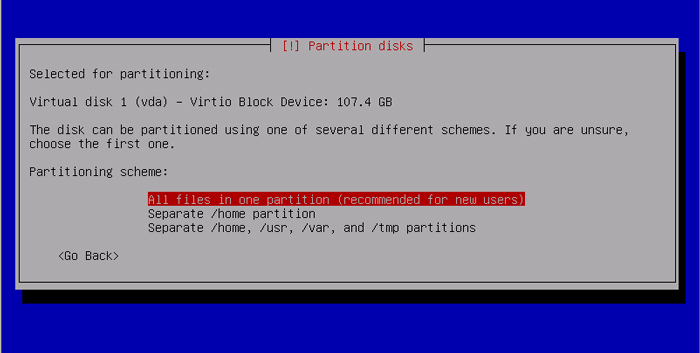 To configure the package manager press «Yes» to select a network mirror. 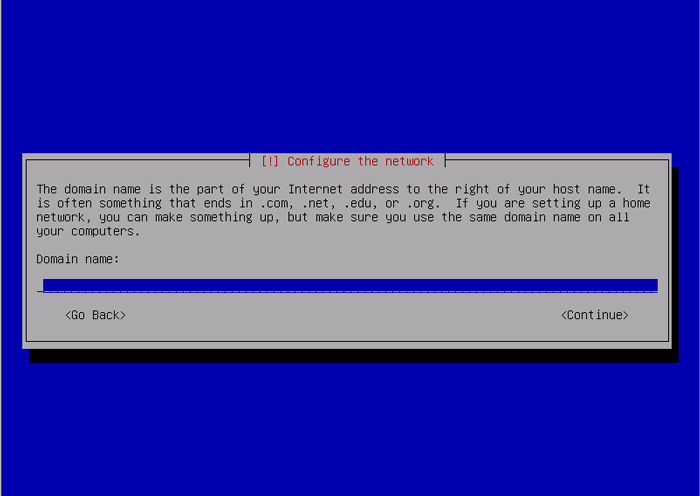 Further in the list, you can select any connection to the repository, and any address of the server where SSH packages are stored. If you connect to the Internet using a proxy server, you need to register the address of your Internet connection through a proxy, if the proxy server is not used, then leave the field empty. 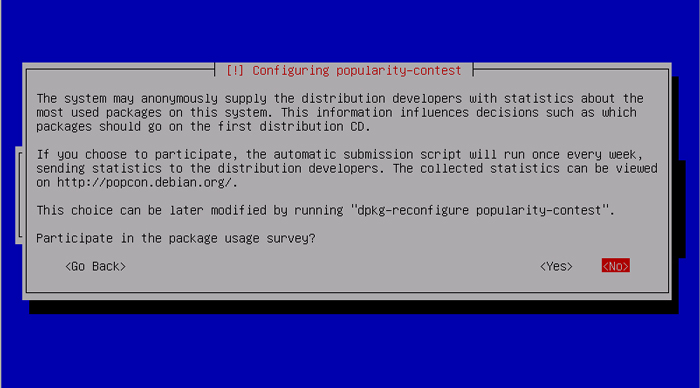 Installation system will offer to take part in the survey about packet popularity. Press «No» to continue the installation process. In package selection screen, select only «SSH» server, and click «Continue». In the opened window Boot Loader GRUB click «Yes». In the opened window the system will inform about the completion of the installation process. Press «Continue» to run the server. License - the basis for the provision of services by the service provider to the client of the service. The license determines the scope of the service through the indication of restrictions, for example by the validity period, the number of users or the number of machines. Basic company - client, user, service consumer (an individual or a legal entity that has a car fleet). User - an employee or another person related to the underlying company. Monitored object/vehicle is a vehicle with an installed GPS-tracker, which is being monitored by the Navitel Monitoring program. GPS-tracker is a data transmitter and receiver device using the Global Positioning System for accurate determination of an object location, used for satellite monitoring of vehicles, people, and other objects, which it can be applied to. Track is a route recorded by a vehicle tracker and displayed on the map. POI (Points of Interest) – POIs are any infrastructural assets and facilities, objects of interest, natural objects, and other points of interest that are displayed on the map. Access group - special object with respect to which the user's rights are checked when accessing the objects of the system. Credentials - user rights to objects belonging to a certain access group.